This handsome ornamental is a subalpine native of the Caucasus region, rarely escaped to roadsides. 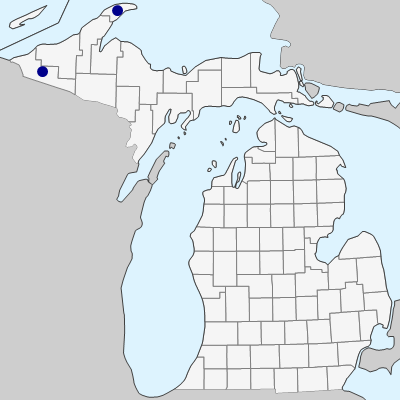 First noted in 1962 and 1963 as established in two places near Bête Grise, Keweenaw Co., and in 1985 and 1986 noted as well established near Wakefield, Gogebic Co. These tall plants (to ca. 1 m) with 1–4 enormous heads of yellow flowers are striking and unmistakable. The stems bear numerous unlobed leaves. MICHIGAN FLORA ONLINE. A. A. Reznicek, E. G. Voss, & B. S. Walters. February 2011. University of Michigan. Web. April 21, 2019. https://michiganflora.net/species.aspx?id=272.